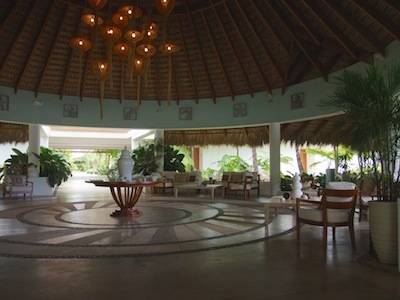 A rotund lobby with an intricate mosaic stone floor makes for an impressive entrance to Sublime Samana Hotel & Residence, a two-story, horseshoe-shaped building with palm trees, exotic shrubs, and flowering plants scattered along a well-watered lawn from which a paved pathway leads to a private beach two hundred yards away. 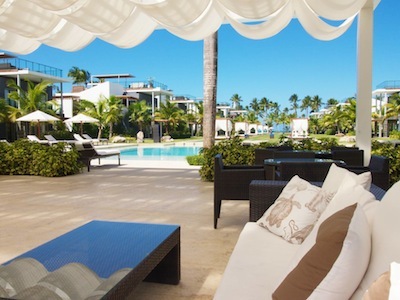 Located on the Dominican Republic’s more isolated northeast coast, the hotel is an oasis of calm, especially in comparison to the liveliness of downtown Las Terrenas two miles away, with a quiet ambiance pervading both the grassy area below the rooms as well as the soft, sandy beach itself. Private casitas line the pathway. A tennis court, a basketball court, a gym, and bicycles provide options for the more athletic while a play area designed with a purple dinosaur theme and complete with swings, a rope bridge, and a hut on stilts caters to the adventurous whims of children. The curved, palm-fringed beach is a long, sloping, narrow strip where spa treatments take place, with shallow turquoise water just offshore. After an enjoyable massage under the fluttering curtains of a canopy, I was delighted to be handed chilled milk straight from a coconut. For the more timid swimmer, there is also a small open-air pool closer to the hotel rooms and casitas, with lounge chairs and wicker tables set all around it for relaxation. 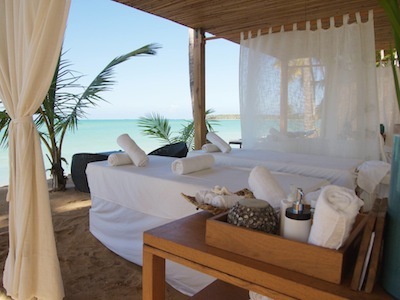 Private over-water cabanas located alongside the paving stone pathway leading from the rooms to the beach offer even more languorous options, if one decides to purchase a holiday home there. The hotel rooms, all self-catering, are located along stone walkways that wrap their way around the entire building. Each has its own veranda overlooking the manicured lawn below, the nearby mountains behind, or the beach area in front. Our door opened on to an expansive living room and kitchen combined, decorated in white, with a substantial-size dining table, sofa, coffee table, television, and large refrigerator. A small toilet was to one side. Beyond, but open to the living room, was the bedroom, with a railed veranda on one side with wicker chairs and a table and on the other, in a recessed area, a second toilet, an open washing area, and a stand-alone, glass-fronted shower cubicle. Simple framed prints with marine themes — shells, algae, and boats — adorned the walls. Breakfast can be taken either in the Bistro restaurant on the ground floor beside the lawn or, more interestingly, adjacent to it, outside, on a small terrace shaded from the sun by white curtains and large exotic plants. The menu is a balanced one, including healthy options of fruit, yogurt, and cereal as well as more substantial items such as pancakes, ham, cheeses, omelets, breads, and pastries. Two of the hot choices represent classic local flavor: Mangu of Samana, a traditional dish of mashed, boiled plantain served with fried eggs, caramelized red onion, coconut, cheese, and sausage, and eggs ranchero, fried eggs served with fried corn tortillas, tomato chili sauce, and guacamole. So replenished were we after trying them, we did not require lunch. The other must-have is the coffee — strong, dark, and Dominican, brewed strongly. In terms of food, however, the highlight for us was dining under the stars down at the beach. Each evening candlelit tables are placed on the sand under the coconut trees with hanging lamps strategically positioned here and there and the soft, swishing sounds of the waves providing a rhythmic, melodic backdrop. Argentinian chef Cristian Baéz swears by fresh local ingredients, naturally placing a strong emphasis on fresh fish and seafood. We began with fish croquettes in coconut, crisp with a surprising but refreshing passion fruit mayonnaise, plus carpaccio of fish with grated tomatoes and yucca croutons, following the starters with a selection of dorado (or mahi mahi) with passion fruit guacamole and baked catch of the day, a complete fish cooked in a traditional Dominican coconut sauce consisting of tomato, onion, and coconut milk. As passion fruit seemed the leitmotif of the evening, we chose for dessert cheesecake of the same name, speckled and smooth just like the sky as seen through the fronds of the coconut trees above us. Waiter service was warm and informal, so much so that the next morning when we ordered glasses of fresh passion fruit juice, the same waiter smiled, remembering, and promptly brought regular refills. Mention must be made of Bruno Gaudio, the Argentinian general manager, who proved to be a most amiable host, staying late on the first evening to welcome us personally and conversing with guests each morning over breakfast, making sure they had all they needed. While Sublime Samana provides enough diverse activities for an enjoyable stay, short excursions are possible. There are bars and restaurants in Las Terrenas. 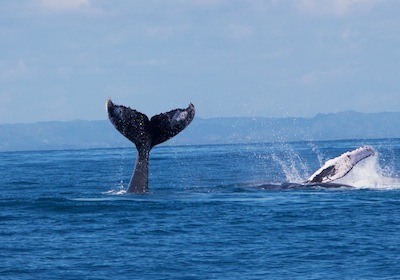 Also available are leisurely boat trips such as those organized by Tour Samana With Terry to see the humpback whales that arrive in Samana to mate, give birth, and nurse their young. Other choices include a visit to the island of Cayo Levantado or to the Los Haitises National Park with its calcified hills, caves, mangroves, sea turtles, and a variety of bird species. More information can be obtained at http://www.sublimesamana.com. If you would like to purchase any of these photos for your publication, please click here to contact the photographer directly.